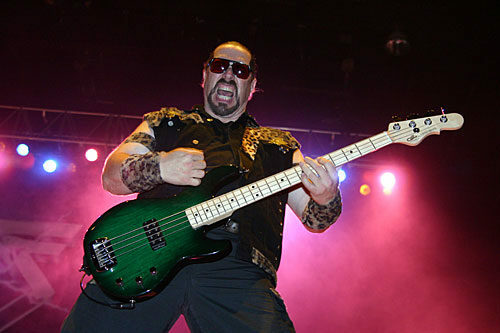 Mark “The Animal” Mendoza, along with drummer AJ Pero, make up the rhythm section of Twisted Sister and despite the fact that the word “powerful” could be used to describe both of them, what it represents for each couldn’t be more different. To fully understand what The Animal adds to the band, you’d have to watch a video of the band performing, because it’s clear ten seconds into any song that Mendoza is raw power. Ferocious power. When big open bass notes need to sound, he literally punches his bass (not in a slap bass kind of way, like in a bar fight kind of way). At other times, he grabs the mic stand in front of him and slams it into the neck of his bass. Even when dramatic flair isn’t needed, and he’s just idling on the root notes of the chord progressions, his right hand never sits still, instead drawing back like a baseball swing before hitting each note again. He does all of this while standing gigantic to the right of the stage, his mouth hanging open in a growl, as if it were just another part of the music, you just can’t hear it over the din of the band. The Animal is ferocious in makeup and out of it. The band is always pretty self-effacing about their musicality. They’ve used words like “simple” or “primal” or, occasionally, “dumb” to describe the music that they make. While their songs aren’t complex, it’s also pretty public that they never wanted their music to be that progressive. Despite their urgent pursuit of success (carefully outlined in a fantastic documentary titled We Are Twisted F***ing Sister) and their eventual attainment of it, their time as a bar band clearly and fully shaped how they play live and how they write songs. The band wants songs that get the audience to jump in time, to pump their fists in the air to every downbeat. The last thing they want any member of an audience to do is ponder during a set. 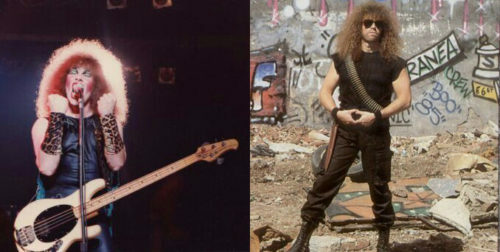 With templates established by the likes of Alice Cooper, AC/DC, and Slade, Twisted Sister found their mode and fully owned it. With that in mind, this band was likely the first time I ever really heard the bass in the mix of the song. 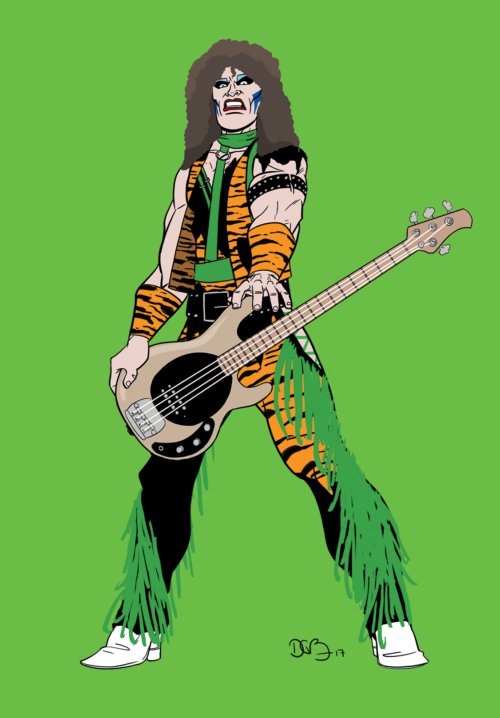 Since they often let power chords ring out, the drums and the bass have to work hard to keep the songs stomping forward, and there are a few songs where the bass is given prominent placement or chances to do quick, standout fills that really add a unique quality to what could be otherwise standard––but effective––rock songs. It’s a testament to a guiding ethic. Sure, as a band they probably could have taken an album to do a musically complex and divergent concept piece, but they, as a group, made a decision about what this thing called “Twisted Sister” should be and they stuck to it. It’s inspiring because when working with an ethos it, I would argue, actually promotes creativity and stability rather than stifling it. A creative space without parameters, I find, is actually limiting because full freedom is overwhelming for the mind to handle. It’s easier to make something when you know what tools are available rather than having every tool available for any project. Though very different music, this is what The White Stripes did––giving themselves severe restrictions technologically (in their case), among other requirements, with which Jack and Meg White had to create new album. In a sense, it’s also a bit of how I approach Long John. There are a few rules I have set for myself that I plan to never break, or, if I do, they will be for an important and rare narrative purpose. First is the technology; All of the interior, narrative pages of Long John will be drawn by hand. No digital should be present aside from the coloring and lettering. For the first chapter, I followed an aesthetic rule to try and always have Long John framed between two strong parallel lines to emphasize the fact that he’s trapped by his old mentality and he needs to break free from it in order to grow. You will never see Long John in his old clothes. These rules, though arbitrary, actually enhance the process for me. If they aren’t strictly improving the art, they are helping to keep my attention and to avoid falling into a nigh muscle memory pattern of creation that allows me to draw just fine but not think too hard about it. I wanted to stay focused and creative while drawing every frame of Long John, and it’s these rules that not only do so, but, because of that, results in a better product, I would argue. I can’t say I got the idea to impose such rules on myself from Twisted Sister, but their example was there and known to me, and what impressed me is that it is clear, in hindsight at least, that this work ethic is something the entire band values and respects. The best evidence of this is when the band reunited after fifteen years apart. Sure, they looked different and even sounded a little different, but when the stage lights turned on it was clear they knew exactly what to do even all these years later. Watch a live show from 1984, 2004, or 2014; all of them are imposing displays of power, never compromising and never not Twisted Sister. The Animal still has teeth.